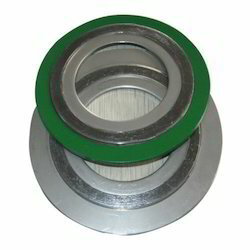 Pioneers in the industry, we offer spiral wound metalic gasket from India. We feel pleasure to present ourselves as the leading trader and supplier of a wide collection of Spiral Wound Metalic Gasket. The gaskets provided by us are manufactured using the superior quality raw material as well pioneered technology at our vendors' premises in tune with the defined industry standards. Available in different sizes and technical specifications, these gaskets are extensively used in flanges to prevent the liquid leakage. Apart from this, our quality controllers check these gaskets against several quality parameters to ensure its quality.